Moon Mountain English School, was licenced by the Changzhi City Education Bureau, in July 1996. The school is one of the biggest Private English Schools in the area. It is located in the cultural centre of the city between the Ba Yi Square and the Tai Hang Park. This location combines easy access to transportation with a peaceful environment. The school itself has bright and spacious classrooms with appropriate decorations and comfortable, practical furniture. In short, it is an ideal study environment. The school is divided into three sections: Practical English, Extracurricular English and Examination Training. The Practical English section is mainly in charge of adult training and offers a variety of courses including: New Concept English, Cambridge International English, New Interchange and College English. The school handles 90% of all the Adult English teaching in Changzhi City, and is very important for the growth of the English language in the city. Every year appx. 1000 students graduate from its courses and benefit from the training they receive. Some students have passed the Master Examinations or Study Abroad Examinations, while others have been able to enter the top-range schools or to become more successful in their careers. The Extracurricular secion is mainly in charge of supplementary English classes of middle and primary school students. This section focuses on facilitating the English learning of these students and improving their practical English. The teaching of these students uses a large amount of listening and speaking practice and concentrates on practical language skills, which helps the students’ English ability as well as their schoolgrades. The teaching of this section has been proven to be highly efficient and effective in training the students to cope with the challenges of a future where English will be more and more important. The Extracurricular section of Moon Mountain English School teaches more than 2000 students each year. The Examination Training section is in charge of preparing its students for English examinations. The main courses at present are PETS and CET-4. PETS (), is used as evidence for English ability for employment purposes. CET-4 is the master entrance examination for college students, which is a requirement for most degrees. The students of the examination training section have achieved a passing rate for these examinations above 80%, far higher than the average results. For a succesful school, it is important to maintain a high standard of teaching. In recent years, Moon Mountain English School has adopted several policies to ensure this. One is to only employ main teaching staff that have passed strict assessment criteria and continuous quality monitoring of their work., using especially hired experienced teachers as supplementary staff. Another is the use of a strict and efficient teaching staff management system to guarantee both teaching quality and effective learning for the students. There are currently 20 part and full time teachers working at Moon Mountain English School. In order to facilitate learning, the school uses teaching aids like computers and audiovisual classrooms, and is working to open an English book library and to install advanced teaching apparatus in each classroom. In order to master English, it is vital that the student has access to an environment in which it is possible to put English into practice. Moon Mountain English School recognises this and is actively promoting the use of English in Changzhi itself. One of its initiatives is the Moon Mountain English Club which was founded on April 23rd 1999. This club offers a wide range of fun activities including English corners, English speech competitions, expert lectures and many others. The English corner meets one time each week, it is very popular and gives people from a variety of backgrounds the opportunity to get together and practice their English. The corner is facilitated by experienced teachers. 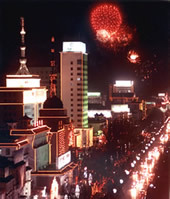 In the summer of 2002 the school promoted this activity by holding the corner in the BaYi Square which gave it more exposure. Thus the corner became a place for everyone! In 2003 and 2004, the school sponsored the “Moon Mountain English Speech Contest”, which was praised as an effective tool in improving the English of the students of Changzhi city, by parents, teachers and students alike. The Adult section also holds English comptetions twice a year, and organises expert lectures. Finally, the school has a yearly English Picnic on National Day which attracts those who are interested in improving their English. The combination of effective teaching management, methods and practice, is the reason for Moon Mountain English School’s good reputation among the English learners of Changzhi. It has been the focus of favorable special reports in both print and broadcasting media of Changzhi City and Greater Changzhi since its foundation in 1996 to the present day. In 2001, the Greater Changzhi government assessed it to be an Outstanding Educational Institution. 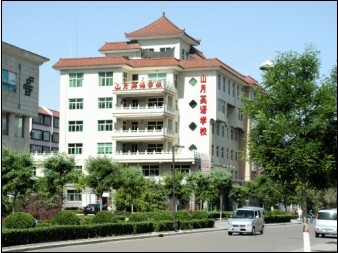 Further recognition came in 2003, when the Shanxi provincial government assessed it to be an Outstanding Private School. In November 2003, it received a license to hire foreign language and education experts, something that requires accreditation from the Shanxi provincial Educational Bureau, the Greater Changzhi Educational Bureau, the Public Security Bureau and the Foreign Affairs Bureau. Moon Mountain English School will use this to further its goal of effective language learning in a good language environment. In the future, it will continue to excel in both the development and improvement of English in Changzhi City. Resources: coal, iron, manganese, aluminum, sulphur, lime stone, gypsum, quartz, marble, and so on forestry resources and animal husbandry resouces are abundant. The history of Changzhi can be reaced back to back to more than six thousand years ago. It was recorded that Red Emperor and Yellow Emperor, the primogenitors of Chinese people, began to taste herbs and develop the farming in Changzhi and Completed the eplchmaking transition from the nomadism to settlement and from fishing and hunting to Zhou and Shangdang for the first time displayed its important strategies position in unifying the whole country. In the Qin Dynasty two hundred years ago, Shangdang was ranked a prefecture out of thirty-six prefectures nationwide, indicating the long-standing history of Changzhi. In the Ming Dynasty about six hundred years ago, the merchants from Shanxi reached every corner of the world and brought significant growth to Changzhi. During the of War of Resistance against Japanese Aggression, the leaders of Chinese Communist Party established their base alongthe Taihang and Taiyue Mountain with Changzhi in the center, creating the set example of resistance against Japanese Aggression and construction of democratic powers. Many moted historic figures were born here, for example, Empress Dowager Cixi who wielded the political power in the late Qing Dynasty, was also born in Changzhi. Thanks to its long-standing history, there are many historic sites here. Other sights, such as Tianyu Nunnery, Chongqing Temple, Town God's Temple, Wufeng Tower and Gate of Shangdang tell people the long history of Changzhi. Changzhi is called a Horticultural City in the northland. People who have been to Changzhi know that big trees are on both sides of the streets in Changzhi, and are greatly impressed with the numerous trees, green streets and beautiful city. At present, the green coverage of the whole city is 1,252.8 hectares including 1,000.8 hectares of recently planted trees. A specific detail that is worth noticing is that, since 2000, the activity of removing fences to show green inside has been carried out in Changzhi City. To release the deep green fenced inside 8,946 buildings have been removed, and as a result, the public green space has been increased by over 400,000 square meters. With the abundance of the green colour, the city becomes vigorous, and with the green colour Changzhi becomes more charming. Today when you walk on the streets in Changzhi, you will be intoxicated with the green landscape and attracted by the beautiful sceneries one after another. Today's Changzhi is really a beautiful "Horticultural City". Apartment: Free Apartment on Campus. Copyright © Angelina ESL 1999-2006 All Rights Reserved.